LONDON--(BUSINESS WIRE)--SpendEdge, a global procurement market intelligence firm, has announced the release of its Global Electronic Manufacturing Services Category - Procurement Market Intelligence Report. The electronic manufacturing services category accredits its accelerating spend momentum to the widespread category outsourcing done by OEMs to obtain a better-quality product as well as achieve almost 15% of cost savings. Despite this growth, the concern over the increasing accumulation of electronic waste and unethical business practices in the manufacturing value chain are anticipated to hinder the growth of electronic manufacturing services during the forecast period. Get access to the free sample copy of this electronic manufacturing services market intelligence report here! The emergence of advanced electronic equipment in the US is compelling OEMs to outsource activities such as testing to ensure optimized performance of the product. This will drive the category growth. APAC is witnessing a surge of activities pertaining to the electronic manufacturing services that were mostly outsourced by the US- and Canada-based electronics manufacturers and OEMs. This has resulted in APAC emerging as one of the fastest growing markets in this category. In Europe, countries such as Hungary, the Czech Republic, and Poland have the highest demand for electronic manufacturing services mainly due to the increase in government support to develop local electronics manufacturing supply chain. 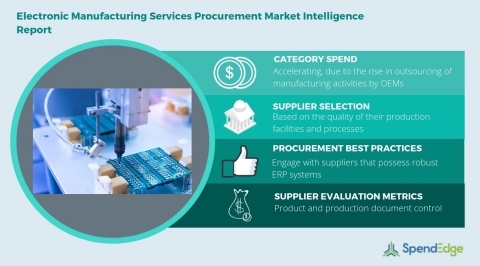 This electronic manufacturing services procurement research report answers some of the critical questions related to procurement challenges and the best category pricing strategies befitting the specifics of this market. Predictive analysis of the key cost drivers, supply market forecasts, and critical category management insights will help buyers reduce spend. To know how this electronic manufacturing services market intelligence report can address your business needs, request for a free personalized version. “Buyers must partner with suppliers that have manufacturing sites and supply chain capabilities to ship to local regions, thereby aiding buyers in reducing their logistics-related costs,” says SpendEdge procurement expert Tridib Bora. Access the complete electronic manufacturing service market intelligence report here to explore its complete scope of coverage. SpendEdge’s procurement market intelligence reports for the manufacturing category offer information on critical cost drivers and category pricing strategies to help the buyers achieve significant cost-savings. The supply market forecasts offer information on supplier performance benchmarking criteria to help buyers reduce spend and establish better SLAs. Additionally, SpendEdge’s reports offer category management insights and procurement best practices for the category.